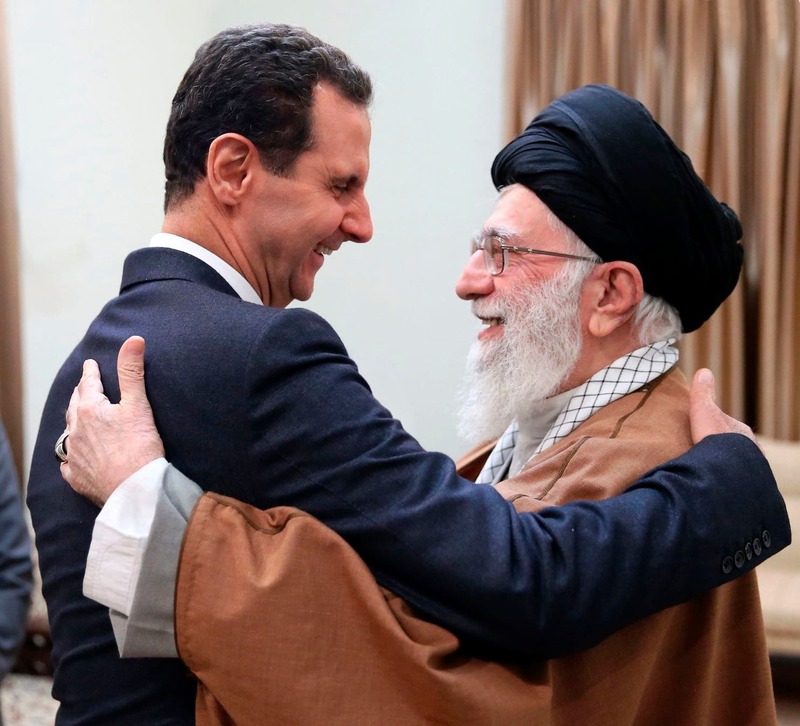 March 9, 2019 (Tony Cartalucci – NEO) – For the first tiirme since war broke out in Syria in 2011, Syrian President Bashar Al Assad has travelled to Iran to meet Supreme Leader Ayatollah Ali Khamenei and Iranian President Hassan Rouhani. President Assad had only travelled outside of Syria on two other occasions during the war – both times to Russia. The significance of the trip cannot be understated – it was a message sent to those who orchestrated the proxy war against Syria that Damascus has prevailed and instead of driving a wedge between it and its allies in Moscow and Tehran – it has only drawn these regional powers closer together. The symbol of solidarity between Syria and Iran comes at a time when Washington finds itself vacillating between a full withdrawal from Syria, a redeployment to Iraq, or an attempt to drag out the conclusion of the Syrian conflict for as long as possible by keeping US forces there indefinitely. U.S. officials said Trump’s decision authorizing a small number of U.S. troops to stay is a key step in creating a larger multinational observer force that would monitor a so-called safe zone along Syria’s border with Turkey. The buffer zone is meant to prevent clashes between Turkey and U.S.-backed Kurdish forces. It is also aimed at preventing Assad’s forces and Iran-backed fighters from seizing more territory. The US will also seek to preserve militants – many of which are openly aligned with designated terrorist organizations – still occupying the northern Syrian governorate of Idlib. While the US has certainly failed in its goal of regime change in Syria and even as it appears weak and confused regarding its policy in Syria and the Middle East in general – its potential to prolong the Syrian conflict and leave the nation more or less permanently divided persists. President Assad’s visit to Iran was not only a symbolic gesture of gratitude for Iran’s role in helping Syria prevail over US aggression – it is also a clear sign that Iranian influence has only grown in Syria. Iranian-backed militias have spread across both Syria and Iraq to confront US and Persian Gulf-backed terrorists including various factions of Al Qaeda and the self-proclaimed Islamic State (ISIS) itself. Washington’s gamble banked on what it had hoped would be a relatively quick regime change operation following along the same lines as the US-backed proxy war in Libya. The Syrian government was meant to fold quickly – the US appears not to have anticipated its resilience nor the eventual Russian military intervention in 2015. Washington may also not have anticipated the scale and efficacy of the commitment made by Tehran. Instead of liquidating one of Iran’s allies thus further isolating Tehran ahead of US-backed regime change efforts aimed directly at Iran – the terrorist proxies the US and its regional partners sponsored in Syria served as impetus for Tehran to broaden and deepen the presence of its forces – including militias sponsored by Iran – across the region, and specifically in Syria and Iraq. US policy papers predating the 2011 proxy war against Syria – including the RAND Corporation’s 2009 publication titled, “Dangerous But Not Omnipotent : Exploring the Reach and Limitations of Iranian Power in the Middle East,” noted that much of Iran’s domestic and regional policies revolved around self-defense. Iran’s strategy is largely defensive, but with some offensive elements. Iran’s strategy of protecting the regime against internal threats, deterring aggression, safeguarding the homeland if aggression occurs, and extending influence is in large part a defensive one that also serves some aggressive tendencies when coupled with expressions of Iranian regional aspirations. It is in part a response to U.S. policy pronouncements and posture in the region, especially since the terrorist attacks of September 11, 2001. The Iranian leadership takes very seriously the threat of invasion given the open discussion in the United States of regime change, speeches defining Iran as part of the “axis of evil,” and efforts by U.S. forces to secure base access in states surrounding Iran. Some of Iran’s asymmetric capabilities are threatening. Because of its inferior conventional military forces, Iran’s defense doctrine, particularly its ability to deter aggressors, relies heavily on asymmetric warfare. Iranian strategists favor guerilla efforts that offer superior mobility, fighting morale, and popular support (e.g., the Hezbollah model in Lebanon) to counter a technologically superior conventional power— namely, the United States. These militias would end up playing a significant role in neutralizing both asymmetrical forces sponsored by the US and its regional partners, as well as conventional military forces deployed by the US and Europe in both Syria and Iraq. It is clear that US policymakers were aware of Iran’s capabilities – and either ignored them or believed their own plans had sufficiently accounted for them. Iran’s significant and long-term investments in sponsoring resistance forces including Hezbollah and Popular Mobilization Forces (PMF) across the Middle East coupled with Russia’s significant conventional military capabilities left little chance for success for US-sponsored militants – with Russia’s role in Syria preventing a more muscular conventional military response from the US when its proxy forces began to crumble. The US and its regional partners – particularly Israel – have expressed a determination to dislodge the growing Iranian presence their own proxy war on Syria necessitated. However, despite repeated Israeli airstrikes on Syrian territory – it is clear that such airstrikes alone will accomplish very little and in the long-term even signals weakness that will only further rally Iran’s allies, justify their continued expansion across the region, and further broaden and deepen their positions well beyond Iran’s own borders – making a US-led regime change war against Iran itself a more remote possibility than ever. The US faces an ignominious retreat from the Middle East – as well as from other areas around the globe. Its refusal to shift from its 20th century unipolar hegemonic ambitions to a constructive 21st century multipolar player may be closing permanently windows of opportunity that will cost it significantly as others displace its influence and reach in regions like the Middle East. Russia and Iran are clearly benefactors of Washington’s stubbornness. But as Russia and Iran have both repeatedly expressed a desire for more constructive relations with the United States – perhaps policymakers in Washington believe they can risk pursuing destructive hegemonic ambitions to carve out or coerce from the region the best position possible in the Middle East before coming to the table to negotiate. More likely though – the world is witnessing a 21st century rendition of the British Empire’s withdrawal from around the globe, stubbornly being thrown out of one corner of its realm after the other until relegated as Washington’s subordinate. For Washington, there is no other Western power for it to hand the torch of Western imperialism over to. Once it is evicted from around the globe, it will struggle to find a relevant or more constructive role to play in these regions ever again. By virtue of Washington’s shortsightedness and its inability to adapt to the world as it really is versus how Washington desires it to be – Washington has proven itself unfit to lead the “international order” it presumes dominion over. Iran’s patient and measured resistance has proven capable of challenging and rolling back American hegemony in the Middle East and serving the ultimate goal of Tehran’s asymmetrical strategy – the defense of Iran itself. While the prospect of US war with Iran can never be fully ruled out, it is a possibility that appears to be fading into the distance as US power wanes regionally and globally. But a flagging empire is a desperate empire. While the days of US regime change wars burning a path of destruction across the Middle East appear to be over, continued patience and persistence must be maintained by Syria and its Russian and Iranian allies to ensure the victories they are celebrating today endure and are expanded upon well into the future.